Everyone at some time wishes they had been born in black and white. The glamour of old movies featuring Bogart and Bacall, Rita Hayworth and Carole Lombard retain a magical allure. Why not have yourself painted in such period style? We have been asked if we can do it and the answer is yes! You can include yourself, partner and friends; and even your horse! Or you can have horses from the golden age such as Phar Lap, Seabiscuit or Golden Miller. You could be a crooked bookie, gangster or his moll; a glamorous movie star or jockey , trainer or tic tac man of the time. We can style you using our own vintage clothing collection or source pieces for you; then arrange a photoshoot. We have vintage furs, trilbies, tweeds, and raincoat and covert coats, flatcaps and period dresses. Should you want a special piece to keep or if we don't have your size we can even source these for you reasonably. Artists David also designs fashions; and styles photoshoots;so this can be done professionally and well. We can even get your hair done in period style by a stylist who works on movies and fashion editorial shoots. You can even keep the shoot images and we can publish them in a coffee table book all included in the price. 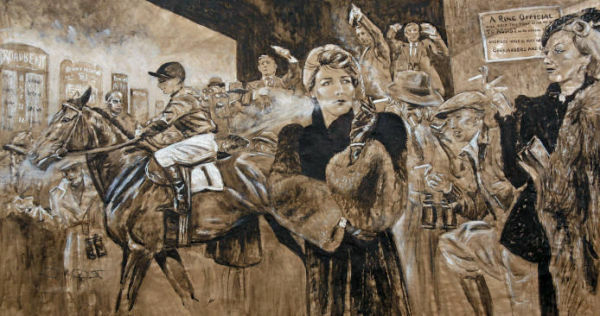 The piece de resistance being a large stunning original artwork set in a period time that will see you immortalised in Film Noir or Hollywood silver screen style. Now is the time! Remember we are very busy on commissioned work up toward Christmas!